The Doctor visits an advanced society that is protecting a large secret. This was an entertaining story. 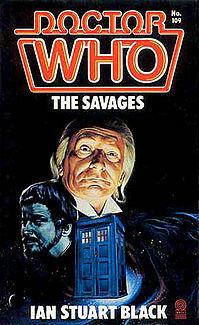 The overall plot involves a civilized society and a lower-class culture of “savages.” This is a power-play storyline that is similar to the various moral stories that were presented in the original Star Trek. What is a savage? Who determines the welfare of the greater society? Is a civilized world a better world when you consider the consequences? Are the savages really savages or are the “civilized” society the true villains? The novelization handled the story well and I was curious as to how the citizens handled their changes in the coming years. Steven’s casual dismissal of Dodo was irritating. “She always gets feelings likes that,” said Steven. “She imagines things.” I haven’t seen an example of Dodo being flighty or exhibiting hysteria. That Steven doesn’t want to listen to reason when everything looks “too perfect.” I was a little sad at Steven’s depature but I’m not going to miss his character. He was far too pushy and impatient for my liking. I think I’ll miss the potential that Steven could have been. This is one of those novelizations in which I really want the original footage to be found. Great pacing, interesting dialogue, fun overall. This was the last appearance of Steven Taylor.